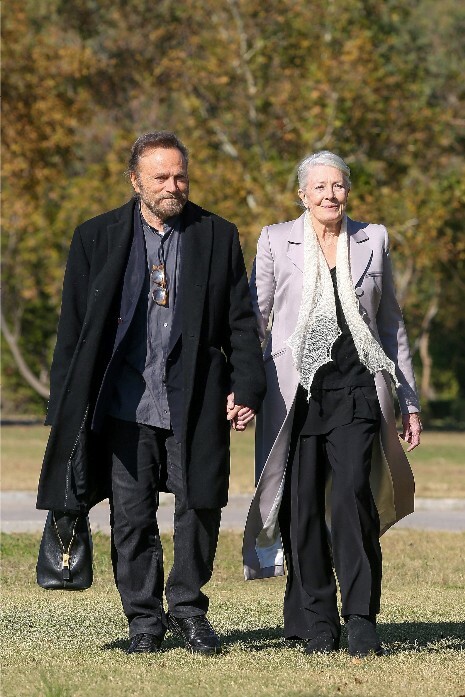 Until we saw this photo we didn’t realize that Vanessa Redgrave,78, and Franco Nero,74, were a couple. It’s a sweet story. Back in the swinging 60’s they were both young and hot – she shot to stardom in Blowup and he was a tall and hunky Italian movie star. They met when they costarred in Camelot in 1966 and fell in love. They had a son Carlo in 1969 and eventually drifted apart and moved on with other partners. In 1996 they rekindled their romance and have been married since then. Above, they took a break from a film festival in Turkey and went for a romantic walk. wonder why they bothered getting married this time. Should have done it back when children were involved. Who cares now? It is good to see that there remains an active spark after all of these years. I always thought her late daughter, Natasha Richardson, was a beauty and good actress. sorry, but who are these people? Redgrave and Nero are and were major stars. Do a bit of Googling and you’ll see. Yes, marriage when they were having a child would have been preferable, but it’s never too late to do the right thing. They found within each other the quality of love that survives time, and inspires commitment. All too often, people base their major life decisions on transitory feelings – while it took these two more time than most, they got to a place where their love means more than a physical attraction. Humor, friendship, shared experiences are the glue that hold a relationship together, and happily, they came to realize that. they’ve been 2gether pretty much 4 ever, whoever writes this thing…. get with the program. Wow, he is virtually unrecognizable. He used to be so good looking.